What a great style! A clutch and no socks – love it. the forest green clutch is gorgeous! Lovely !!! He really looks great!!! This bag is amazing right????! Oh so Italian! I love his dark green man-purse. In winter? With a coat? No socks? NE-VER. Piccioli or whoever. That’s not elegant. 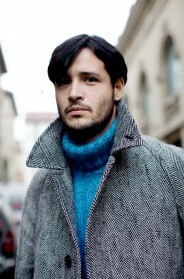 From the magazine The Sartorialist never convince me these “fashions”. I’m scrolling down from the top of the picture thinking- ho hum – then those feet! Witty guy. The distinctiveness of his stance is what makes the suit. What an adorable man bag – and those ankles – love. Hope I’d see through your eyes!!! He ALMOST had me and then I got to the purse and no socks. Ruined a perfectly good look. Although maybe he is holding the purse for a lovely lady that is not featured in the photo. But still – socks. Please! Thanks Sartorialist – you are the best! Is his leg broken? Because the knee is definitely in the wrong place otherwise. This needs to be said to get the world of masculine style set right on its axis: This man, in this post, with that bag, and those bare ankles, needs to be punched in the face, and sent home to change. From the neck up, he looks like he’s packing a .45 in a shoulder holster. GREAT! Then, from the neck down, he’s all woman – a masculine woman. This man, in this photo, is a disaster. What a fabulous outfit, I love his green bag. I will never………….ever………….understand the aesthetic of the bare ankle in dress shoes with dress trousers. Maybe not the popular reaction, but it’s mine: grown-up adult men wear socks. OK, folks, the sockless thing with a suit is over. It’s been done. It’s no longer fresh or clever — it’s ridiculous. flirtin’ with the feminine. ooooohhhh! sooo funny these comment lol if he comes to ny wear socks and dump that clutch!! Not feeling the sockless dress shoe thing. Not only does it look awkward and unfinished, it’s gotta be uncomfortable in brogues. Loafers, sure but not a proper lace up shoe. It looks unfinished to the point of absentmindedness – like walking around with an open fly! @ J: I find your contention that a man who doesn’t meet your idea of masculinity “needs to be punched in the face” both appalling and flat-out scary. Love the way he carries a clutch. I wished I had that sort of personality. No socks with sandals, yes, otherwise please make it stop. Those shoes will rub. Like many commenters here – I reckon time’s up, again. The bag is nice in itself, but … I’m too conservative. Seems overall Milan always no. 1, though. I love his style! Great coat and shoes! As an italian woman with some experience in fashion I must desagree with this style. It’s like watching a man who dreeses like a woman who dresses like a man. The coat is a little big, the clutch is a little feminine. and first of all: the socks! Loafers in summer time with no socks are okay. But a man who doesn’t wear socks, in winter and with elegant shoes, is a “TRY-TO-HARD” fashionista. When you go to Pitti you can spot the italian “rappresentanti” by their try-to-hard attitude to follow fashion instead of weariing what is best for their age, or better, for their body line. What a great heir of his master! Sober, mysterious, but that knows when to add a special detail like the bag..perfect. WOW! what a strong style! lovee his bag!! the picture is really nice!! in the city it doesn’t make sense. I don’t care much for wearing socks either. Love his bag! Nice “touche de couleur”. What we should learn from this is that a man looking as slick and well presented as this, and most never are STILL can’t pull off a murse. Stop the man-bag murse madness. Insouciantly sockless…secure in his masculinity…sharp. I’m sorry, but I feel that brogues without socks is (are?) a bit pretentious. We see it a lot here and I think it’s just become self-consciously too cool. It really appalls me how on what I would consider a forward-thinking and open-minded forum, people have such tasteless, misguided and purely hateful remarks. I come to this site, admire the pictures, watch the videos and take part in the discussions as a sort of getaway from the (mostly) overly-stereotyped, close minded and intolerant American society I am exposed to on a regular basis. So when I come on here and see the multitude of sexist, baseless and purely worthless criticisms thrown out at a person due to him carrying what is perceived by others as a “feminine” bag, or him not wearing socks, I am just ashamed and disappointed. You are all better than this. You are all better than the greasy T-shirt and baggy jean wearing “men” whom I was so accustomed to seeing in the Upper Peninsula of Michigan for 7 years. Let the man what ever the hell he wants to wear! There is no need to tear him down based on something you don’t agree with. Furthermore, you should take into consideration the overall “picture” that is displayed here, not just a few discrepancies that you may notice. What makes this image work is how well this man injects these expensive fabrics and his formal attire with a bit of casual fun. What I think is so refreshing about this picture is that it drops some much needed foreshadowing of a season to come. There is just enough casual cool (no socks) and colorful playfulness (the forest green clutch bag) amidst the sobriety of the winter palette he employs to indicate that Spring is fast approaching. Mr. Schuman, thank you for what you do: Bringing a little bit a hope to a man disillusioned by the inadequacies of his society, one picture at a time. I will never understand why there’s so much anti-man-bag prejudice? They’re practical and look great. Where else am I supposed to put all my stuff? What to say here? Really fashionly outfit there. Not just a regular suit – I like it! I know you just did a whole thing about the barefoot-in-shoes phenomena, but I still think it looks dumb. Love the shades, though. He looks great! love this bag! 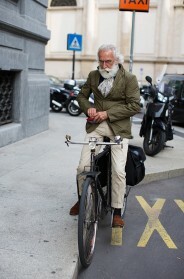 @Niccotina – totally agree, especially on the -rappresentanti italiani- that try too hard at Pitti. LOL! Have nothing against the no-sock look so popular today, even with lace up oxfords like these, but not in the winter! And that green bag with a full black outfit doesnt do it, he should play more with some more colour in the outfit (black suit-tie white shirt yaaawwwns me to death) and THEN add a green bag. That is coolness. It is rock n roll. Gentleman rock n roll. Reminds me a bit of of Bryan Ferry. But there is a crack. His posture is so fragile. He bends his back he angles his foot. If we could only see his eyes…. What type of coat is that? Kristijonas I think you are confused. We speak about fashion. Personally I don´t know Mr. Piccioli. There is not something against him but we can express our opinion about his clothes in a web about fashion. My opinion, a man without socks in winter is ridiculous, not him, only the way that he (don´t) wear his socks. Ok? Does anyone have any idea what bag that is? Niccotina has it right: would look less ridiculous with socks. And, why is the jacket so long? But maybe go more out there like with these! He looks smart, that’s a lovely coat. but they’re right, he’d look smarter with socks. Naked ankle is just distracting, cuts the line of his leg off short and to me, always looks uncomfortable in formal clothing/shoes. Save it for the coast or the very young. The whole no sock thing… all I can think of is sweaty feet slipping around in the leather and blisters on the heel. Can’t go there. I’m not sure why it would be OK for a woman to wear a short skirt with open-tie, backless heels, and no stockings in the winter, but not OK for a man to wear long trousers, shoes that cover his feet, and no socks in the winter. I guess we expect women to be shivering and fragile and men have to wear socks even if his feet are warm in heavy shoes. I have been having fun with funky socks for most of this winter, but seeing this picture makes want to peel them off right now! Impressive, but… did he forgot the socks? Love that he doesnt have socks! to odd for me..no socks and a lady’s bag..